>who doesn’t love a good casserole? Hmmm, so I feel as though the above picture does not do my casserole justice. This was an exceptionally tasty, and ridiculously fattening dish. I suppose it could have been made less fattening, but really where’s the fun in that? 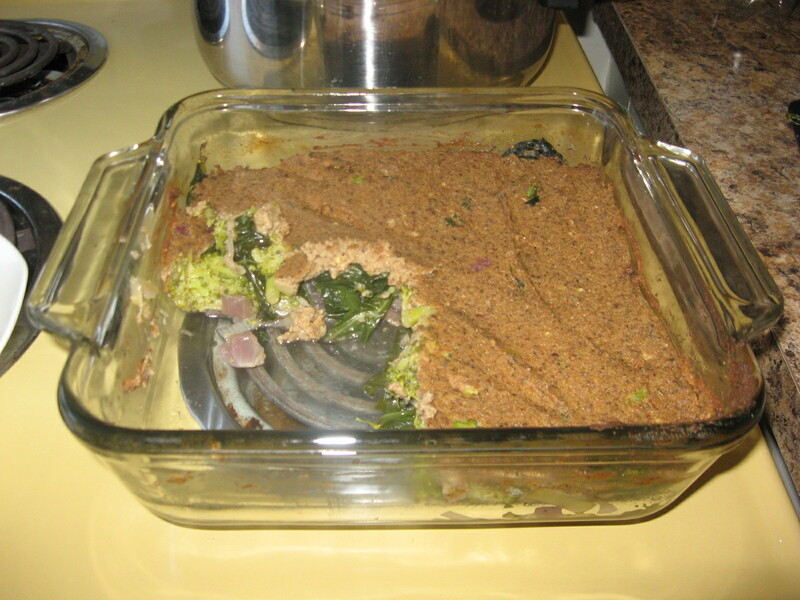 This casserole is the perfect Sunday dinner type meal…or it would have been if Fialonia and I had had the good sense to make side dishes to go with it (I’m thinking beets, turnip, and steamed carrots…yum!). Instead, we just ate casserole which means that we got in about four servings of green veg (yaya) and 500 servings of olive oil and vegan cheese (less yaya). Preheat oven 350C. Chop up your veg. In a large saucepan, saute onions until translucent and then add the rest of the veg, garlic, water/wine, and salt. Cover and let cook on low while you whip up the top. For the top, blend everything together in your food processor (or blender…although in this case I think food processor would be easier). Start with the bread and spices then go to the tofu, cheese, oil etc. Pop the veg in an 8×8 baking dish and spread the topping on, well, the top. Stick in the oven for about 15-20 minutes. Served with side dishes, this meal easily fills four people. Lazy girls home on a Friday night? Serves two. Off to work on the thesis some more. Rockin’ Saturday night!